In Caves and Corridors: Mystery Island, you play an explorer named Jake, searching for an elusive golden idol while navigating beaches, jungles and volcanoes. On his search, he collects gems, coins, and Mystery Island fruit, but he must watch out for deep waters, falling boulders, and dart-blowing statues just to get out alive! When you complete a level, the game will assign a trophy to that level based on your performance. You will need a silver trophy or better to advance at certain parts of the game. Getting silver requires that you complete the level, collecting as many gems, coins, and statues as you can in a sufficient amount of time. The amount of time varies per level. Boulders Boulders roll around the level and fall down. If they fall into water or lava, they will regenerate and fall from the very top again. If hit by a boulder, Jake will lose a life. Spikes Spikes stick up from the ground. They appear and disappear at regular intervals. Watch out for these crafty devils. 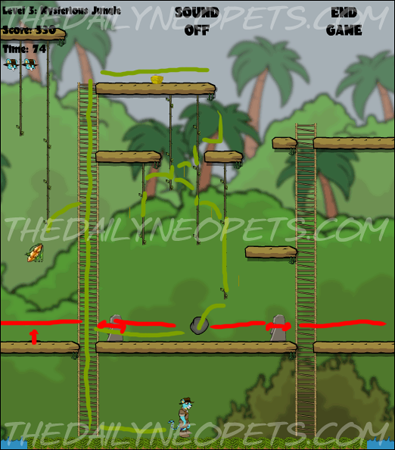 Jake can cross spikes while they are down, but he will lose a life if he attempts to walk on spikes while they are up. Statues Statues will shoot darts at you if you are in front of them when their eyes turn red. If you are behind them, they will turn around, so you are never safe. The darts will kill Jake. Lava and Water Lava and water will both kill Jake if he tries to walk onto them. 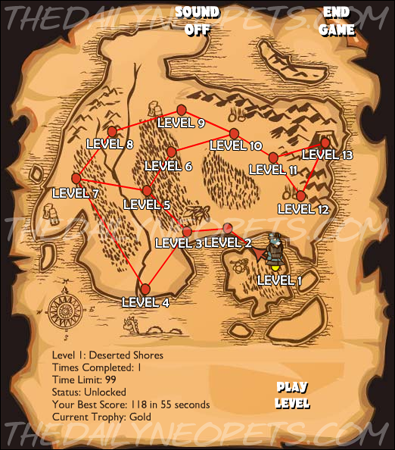 The below images are suggested routes to take to complete the levels. The lines in green are good ways to go, and the lines in red are where dangers lie. The route may not be the quickest, but it aims to get the most points - which is really what we're here for, isn't it? Head up the ladders to your left and up the vine. Cross the top platform and go down the vines to the right, collecting the coins and the fruit as you go. Just watch out for the boulder! If you're in doubt, stay away from the danger until it has cleared. Be wary of both the boulder and the spikes in this level. Climb the vines to your left and collect the treasure and the coins. The boulder tends to spend a lot of time on the platform to the left with the spikes, so take advantage of that time to collect the treasure, then wait on the middle vine for the boulder to fall off. Make sure you're out of the boulder's path! Then, pick up the gold items and continue down the vine toward the fruit - but beware of the spikes underneath it! Stay on the vine until one of the spikes goes down, so you can safely collect the fruit. This time there are no boulders or spikes, just statues. Since there are no vines to hold on to, you'll need to jump over the water. Take a running start up to each jump, and don't jump too early. (It's tricky; even I still fall in!) Get the green gem first and then continue to the red gem. Climb up the vine and onto the ledge with the statue, down the vine to the right and jump off onto the center ledge. Grab the coin and make your way back, climb up the ladder, and jump toward the last treasure and the fruit. 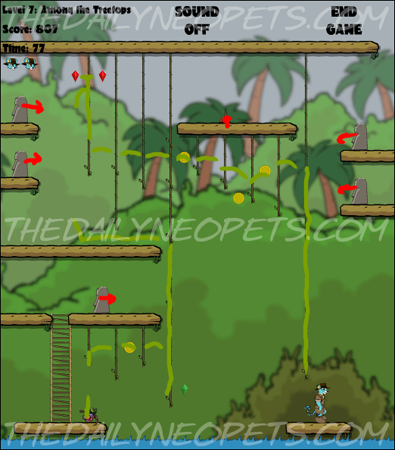 The statues are very easy to pass compared to the other obstacles, so you shouldn't have much trouble with this level. This level has both boulders and statues. If you don't plan correctly, the boulders will block you off both sides, leaving you nowhere to go! So, wait in a safe place, such as those circled in black, until the boulders have passed. The two statues are in difficult positions, since you are on their level for a significant amount of time. Just hope they don't shoot, and carry on. 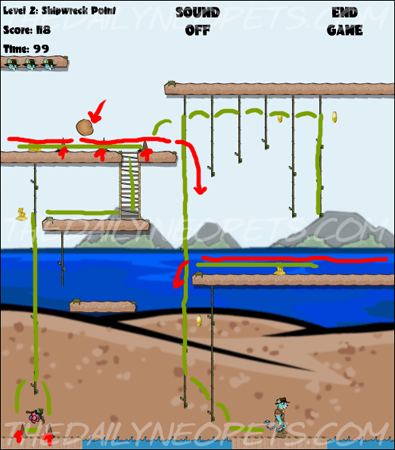 The obstacles are all on one platform, so this level is very easy. 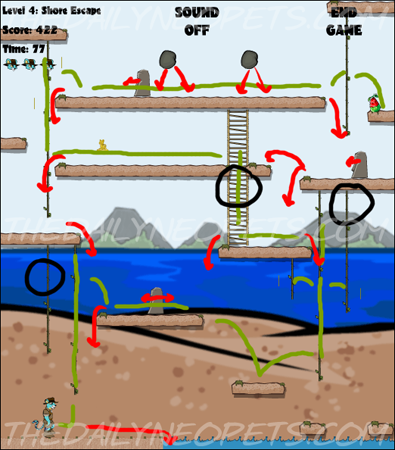 Take the left ladder up to the top platform and work your way down the vines to collect the coins, then make your way back to the left ladder. 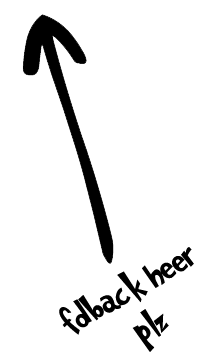 If the boulder is in an awkward position, you can drop down and go down the right ladder and up the left ladder to bypass the boulder. Go up the long vine and jump towards the fruit. If you miss, beware of the spikes just below it. Spikes and statues dominate this level. Be wary of where you're jumping and any statue that could cause problems. Climb the ladder and jump over the spikes. Either grab the vine going over the spikes or wait until one of them is down - otherwise it's almost instant death. Collect the coins on the vine, then jump down to get the red gem. Climb the ladder, jump back to the vine, and make your way across and up to the top platform while trying to stay clear of any darts coming from statues. Drop off the top right platform to get the fruit. This level has only statues - and it gives out a lot of points! 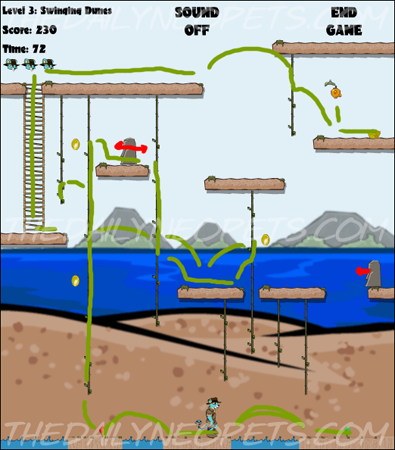 Start by climbing the long vine and moving leftward to collect the coins. If you find the correct height and keep going right without moving up or down, the statue to the left won't notice you. Grab the two red gems, then head down the long vine to get the green gem. 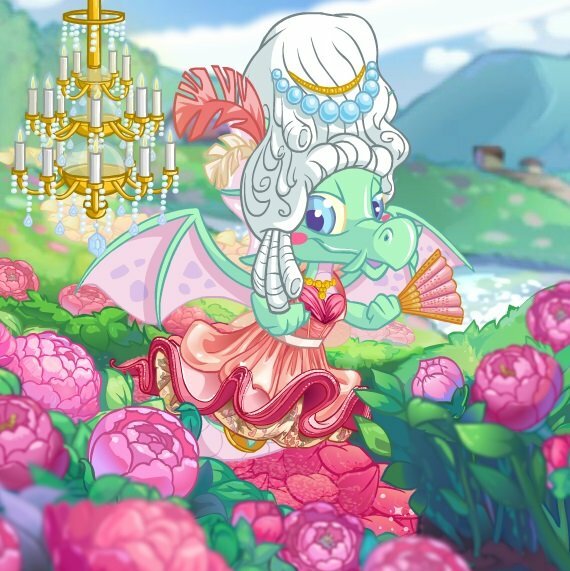 It blends into the background, so it's easy to miss! Make your way left across the vines and drop down onto the fruit. Start by climbing the vine and walking left across the platform. Jump to the left vine and continue up, picking up the treasure on the way. Walk left across the platform, jump to the vines, and climb the ladder to the fruit. Only boulders to worry about in this level! Climb the ladder and the vine until you reach the circled area. Wait in the circled area until the platforms above and to the right of you are clear, and check that the top right platform does not have any boulders about to fall down on it. Then make a break for it! Cross the vines, grab the gem, drop down to the platform below and, like the leaps on level 3, take a running start to the left edge of the platform and then jump for the vine. Failure to do this will either kill Jake or get you a bronze medal. Either of those aren't useful, so try your best. Cross the vines to the right again and get the fruit. Watch out for the statues in this level. 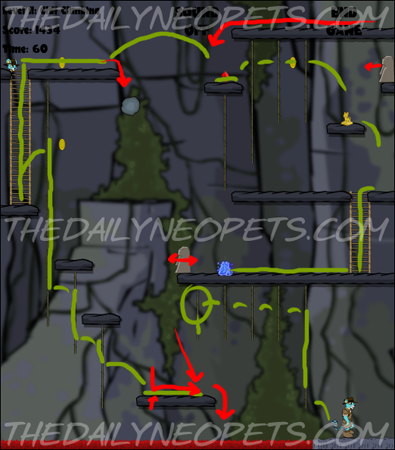 Take the long vine to Jake's left halfway up, and then head toward the red gem in the bottom left area. Getting out of this area can be tricky. 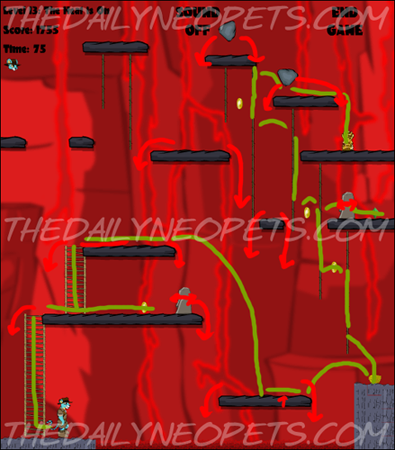 After picking up the gem and the gold, you'll need to jump from the vine to the small platform. 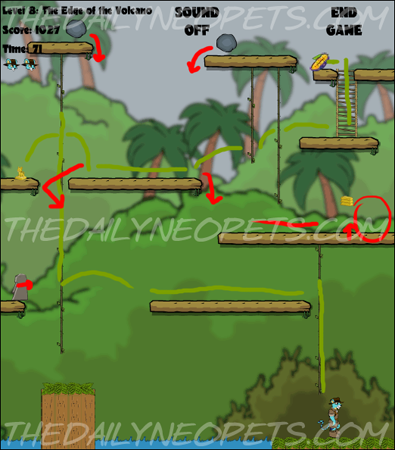 To do that successfully without missing or overshooting, climb to the very top of the vine to the left of the small platform, press the right arrow key so Jake is dangling off the vine, and then jump. 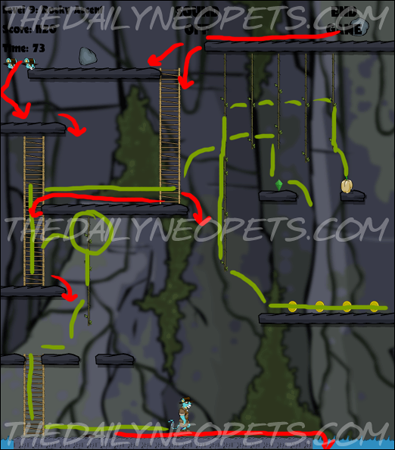 Continue up the long vine and get the coin, then jump to the long vine on the right side. 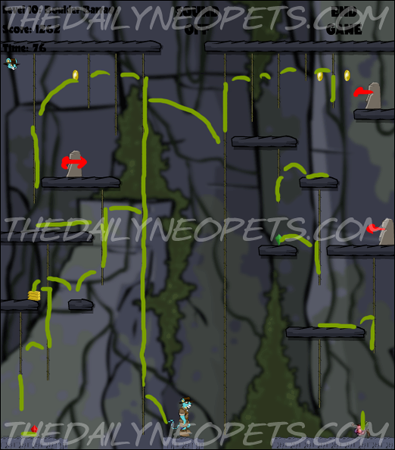 Here, you can either cross the vines or drop onto the platform and take a running jump toward the coins. Note that you are in close range of a statue, so if its eyes glow red, get out of the dart's path quickly! Drop down to the lower platform, get the green gem while hurrying out of the way of the statue, and keep dropping down to the fruit. You're getting close to the end of the game, so the levels are much tougher! 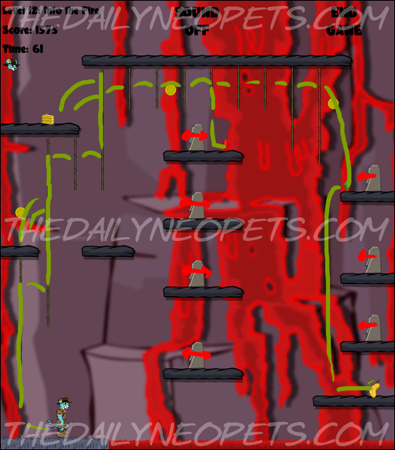 In this level, there are all 3 types of obstacles, plus the lava trap at the bottom, so be careful. Start by crossing the vines to the left. At the next platform at the bottom middle, there's a spike sticking out and a boulder flying down almost continuously. Stay in the circled area or a little to the right to be safe until the spike goes down again and you can continue. Drop down, cross the platform, and make your way up and left along the vines. Get the coin, climb the ladder, and leap off the platform by taking a running start. Pick up the red gem, cross the vines to get the coin and the treasure, and then hurry down to get the fruit. This level can be done so easily, yet still proves difficult for many. There are only statues to worry about, but there are lots of them. If you do set off a statue, just drop down out of the way. It's better to finish the level with a lower trophy than to lose one of Jake's lives. Start by climbing the vines, getting the coin and the treasure. That treasure can be difficult so if you don't get it on your first try, skip it. Cross the vines at the top, remembering to pick up the red gem on the platform with the statue halfway across - it blends into the background. Jump back to the vines and pick up the green gem on the top right platform. Then you can walk off the platform, sail past all the statues, and land safely on the bottom right platform. Pick up the fruit to finish the penultimate level. Hurrah! This level is appropriately titled "The Heat is On." There are obstacles everywhere! If you're paying attention to the boulders, the statues will shoot. If you pay attention to the spikes, the boulders will fall on you. It's basically down to luck. Start by climbing the ladder and crossing the platform to get the coin. 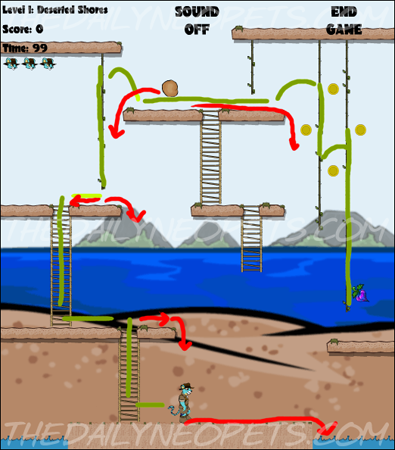 Climb the second ladder to get out of the way of the darts and boulders, then jump to the lowest platform. Jump over the spikes and then jump to the treasure. Climb the vines, making your way leftward and collecting the coins. Climb up to the top platform on the right and drop down onto the fruit. You'll be lucky to get past this level first try, but get that golden idol, and you might have a high score on your hands! Not many people get this far. Consider yourself lucky! You did it! Give yourself a pat on the back, send your score and gloat to your friends that you completed Caves and Corridors: Mystery Island. Hurrah!